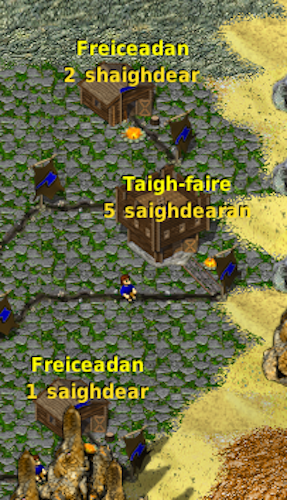 Widelands, Scottish Gaelic localization. © 2017 The Widelands Development Team, licensed under the GPLv2+ . A version of this post  was originally published at r12n . 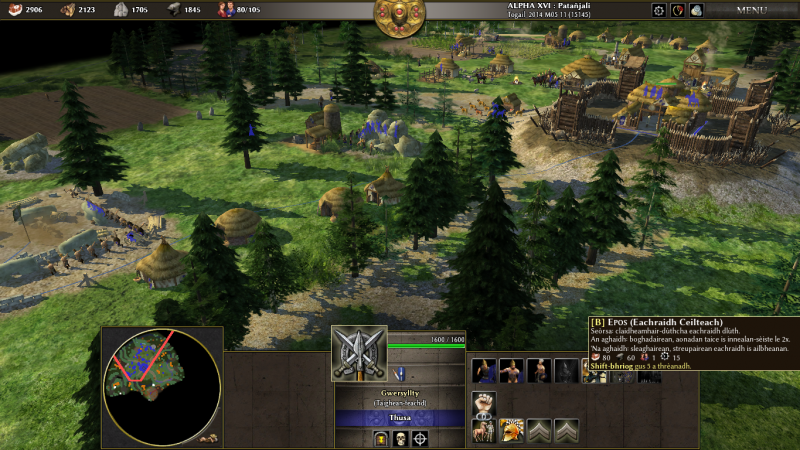 In the strategy game Widelands , the player begins as the chieftain of a small settlement. The player guides the development of the settlement from a single outpost building into a sprawling commercial empire. In many ways, Widelands resembles the game series The Settlers , which first appeared in 1993. While the latest version of The Settlers can only be played in English, Widelands can also be played in dozens of other languages: global languages such as French and Spanish, national languages such as Bulgarian and Finnish, and even several languages of fewer speakers such as Catalan, Galician, and Esperanto. The game’s free and open source software model welcomes volunteer collaborators, including translators, to expand its language offerings. Proportion of respondents in the 2011 census aged 3 and above who stated that they can speak Scottish Gaelic. Image  by SkateTier CC BY-SA 3.0 . Managing the Widelands Development Team since 2016  is GunChleoc, who joined the project as a Scottish Gaelic  translator in 2013. GunChleoc (a pseudonym) has long been a respected member of the free software development community, having contributed translations to dozens of projects and managed broader translation initiatives. Scottish Gaelic (Gàidhlig, not to be confused with Irish, Gaeilge) is a Celtic language indigenous to Scotland. Gaelic is spoken by around 58,000 people in Scotland, and over 7,000 people in Canada. Under pressure from English, Gaelic has been in decline as a community language for centuries, but a vigorous revitalization effort has been underway. A 2016 census  found that only 522 public school students had Gaelic as the primary language at home; however, there has been a recent increase in Gaelic medium education . While there are few examples of commercial software available in Gaelic, an impressive collection of free software  — games, office software, mobile apps, etc. — is now available. 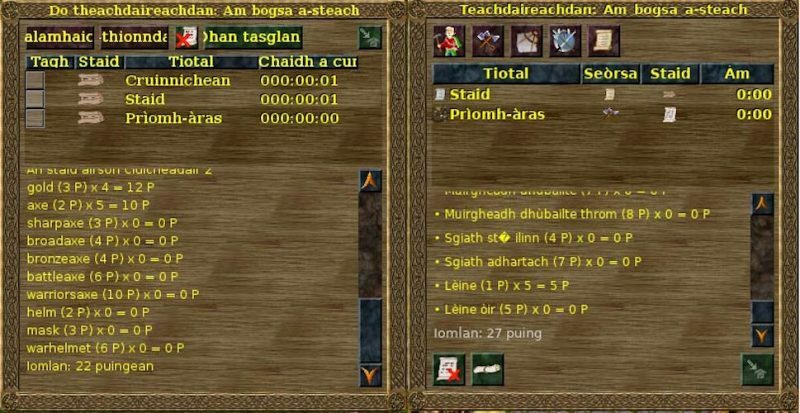 Even more impressive is that this wealth of Gaelic software is primarily the result of the volunteer efforts of just two people: GunChleoc and Michael Bauer , a Glasgow-based language consultant and publisher. I recently spoke with GunChleoc about her experience helping to enable and promote Gaelic-language computing. A version of the game Widelands was first posted online in 2001, and the game has been in continuous development ever since. Perhaps the primary factor in its longevity (aside from the fact that it is a lot of fun) is that it is a free and open source software project, entirely supported by a volunteer community of developers, artists, and writers. In contrast to proprietary software which is typically developed as commercial projects, free software is open to user modifications and contributions. For a video game, these modifications might include new game mechanics or levels, new or refined artwork, and versions of the game that work on different platforms (Windows, OSX, Android, etc.). In the case of Widelands, this includes a global community that has completely or partially translated the game into 60 languages, including Scottish Gaelic (watch the game trailer in Scottish Gaelic below). There is a solid case — moral, social, and cultural, if not initially commercial — for empowering language communities with fewer speakers to use their languages in digital contexts . GunChleoc has long believed that Gaelic deserves a digital presence, and has devoted an extraordinary amount of mostly-volunteer effort — literally years of work — into localizing software into Gaelic. Impressively, she is a not a native speaker, but a learner, which provides her with an additional context for understanding the language. A linguist and computer scientist by education, and a translator by profession, she also maintains the Fòram na Gàidhlig  website and forum for Gaelic language learners. 0 A.D. is a historical real-time strategy game, available in Scottish Gaelic. © 2014 Wildfire Games, licensed under the GPLv2+ . 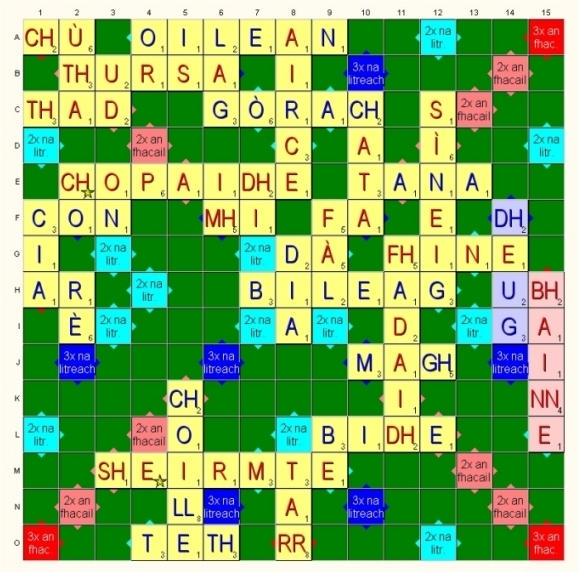 Scrabble3D in Scottish Gaelic. Image courtesy Fòram na Gàidhlig. Translating a software interface — the parts of the program that a user interacts with — relies on two interrelated technical processes. The first process, internationalization (often abbreviated i18n), ensures that software is designed to be efficiently and effectively adapted for use in different languages and regions. The second process, localization (l10n), is the actual translation of the interface — the bits of the software that the user interacts with — into a new language. A software interface is typically developed initially in a global language such as English, and then localized into additional languages. As with any translation process, software localization is typically a highly-skilled endeavor, with the localizer having fluency in both the source and target languages, as well as a level of familiarity with code and software project management. Localization in proprietary projects is typically paid at skilled labor rates. Free software projects might rely on crowdsourcing and volunteer managers. A language like Gaelic does not represent an interesting market for most commercial products — a software publisher can safely assume that most potential customers who speak Gaelic are bilingual in English. Resources invested to Gaelic localization, therefore, are viewed as unlikely to provide a financial return. While a localized version of Microsoft Office is available, such commercial Gaelic-language software products are rare. The majority of software, free and otherwise, is developed in English, the lingua franca of the tech world. The more different a given language is from English, the more types of issues may arise when attempting to translate software into that language. One challenge arises from the fact that many developers have a limited understanding of internationalization and languages, and a coding strategy that works for some major languages many not work for others. 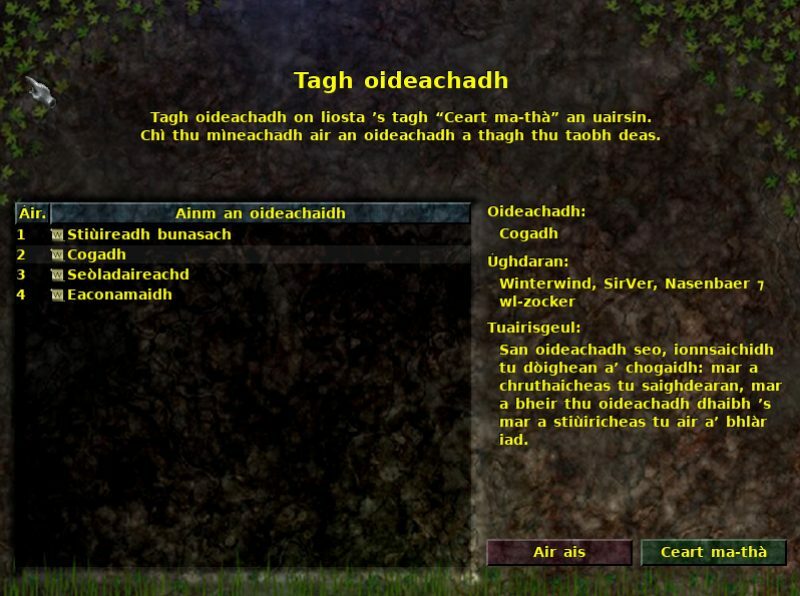 Choosing a tutorial in Widelands in Scottish Gaelic. © 2017 The Widelands Development Team, licensed under the GPLv2+ . The bits of text that a user sees — menu items, buttons, error text, and so on — are represented in source code as “strings,” a variable datatype that holds alphanumeric characters. String variables are often used to store things like one’s username on a social media platform like Facebook, and can be used to create on-screen text to personalize interactions. For example, a person’s name (Jane) could be stored as a string ($username) and paired with another string (“likes your post”, stored as $message) to create a complete message within a template. The pseudocode may look something like this: display $username + $message . Counting soldiers in Widelands, in Gaelic: 1 soldier = 1 saighdear, 2 soldiers = 2 shaighdear, 5 soldiers = 5 saighdearan. © 2017 The Widelands Development Team, licensed under the GPLv2+ . Given the prevalence of English-speaking software developers, interface translation is often a secondary consideration due, in part, to a handful of challenges. First, many developers have a limited understanding of internationalization and languages, and a coding strategy that works for some major languages many not work for others. Second, and perhaps more challenging, internationalization requires consideration of “plural rules” and interface design. In English, most nouns only change once with number, by adding an “s”: 1 post, and 2, 23, or 4,000 posts. The rules in Gaelic, and in many other languages, are more complicated. “Let’s count cats,” GunChleoc begins: “1 chat, 2 chat, 3 cait, … 10 cait, 11 chat, 12 chat, 13 cait, … 20 cat, 21 cat…” And so on. “Our Slavic colleagues are also regularly pulling their hair over this particular issue.” If a user interface needs to provide a count of “friends,” or “points” or “unread emails,” the plural rules of different languages can prove daunting. Likewise, while the English term “OK” fits well on the ubiquitous buttons on pop-up screens, the longer Gaelic equivalent “Ceart ma-thà” may not. The screenshots below demonstrate some of the challenges GunChleoc faces in localizing Widelands. On the left is the previous version of an in-game screen, while the right represents a newer version of the interface with most of the problems fixed. Widelands in-game interface from version b18 (left) and version b19 (right). © 2017 The Widelands Development Team, licensed under the GPLv2+ . The localization challenges in this example included truncation of the button texts (along the top), some text not marked for translation (the items in the main window), and an incorrect plural form: “‘22 puingean’ on the bottom should be ‘22 puing’.” A remaining glitch, soon to be fixed, is the presence of a � in a word where the font renderer is misbehaving— likely a familiar experience to anyone who has worked in a language with accented characters. Such problems are largely “solved” if software developers are familiar with (and use) a standard internationalization framework like gettext . Such frameworks provide a technical structure to more easily account for this linguistic variation. However, GunChleoc suggests that internationalization, or language technology more broadly, is seldom addressed in computer science education programs. “While the majority of projects are very welcoming, you will get the very, very occasional odd reaction from people like ‘Why are you wasting your time translating into a dead language, and why should we be bothered to support it? You will never finish that translation anyway and maintain it through future updates.’” The proper response to this, GunChleoc advises, is patience and perseverance. “More often than not, they are simply uninformed and don’t mean anything by it.” Once a level of trust and understanding is developed, such contributions will be welcomed.